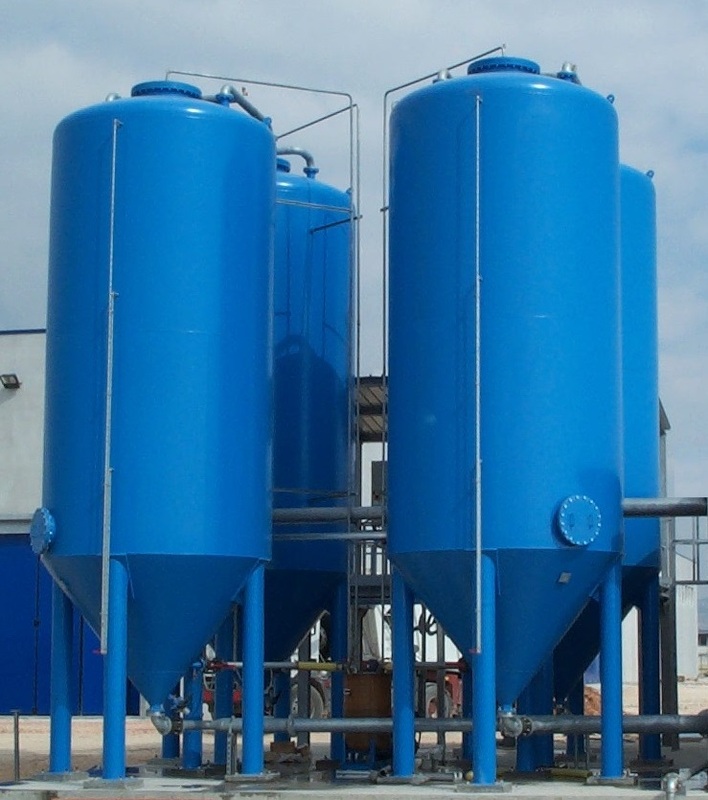 The DTP is a treatment that provides the cleaning of the processing water through a physic/dynamic separation, combined with a filtration process. 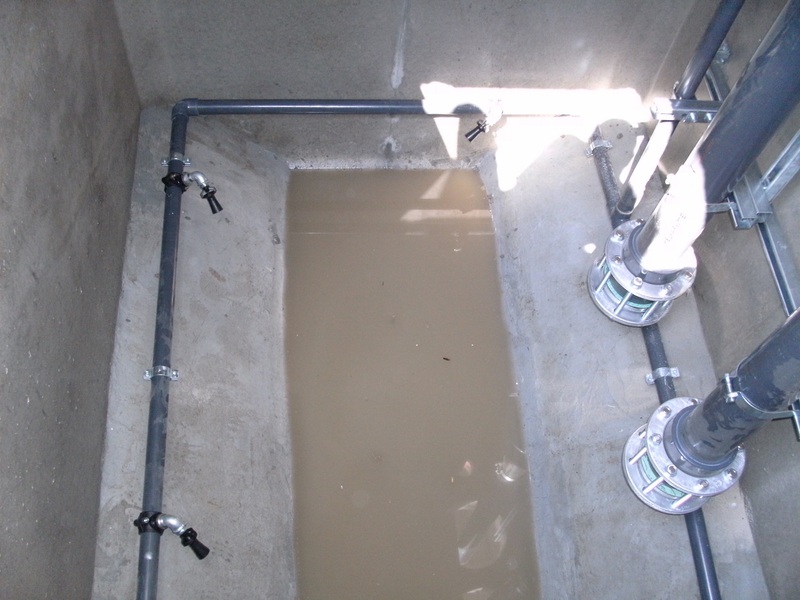 An initial filter, in a small pit just before the collection tank, is provided to stop possible big parts and extraneous material from entering. Two identical pumps operate with daily alternate cycles to take the water from the tank and to send it through the treatment system. 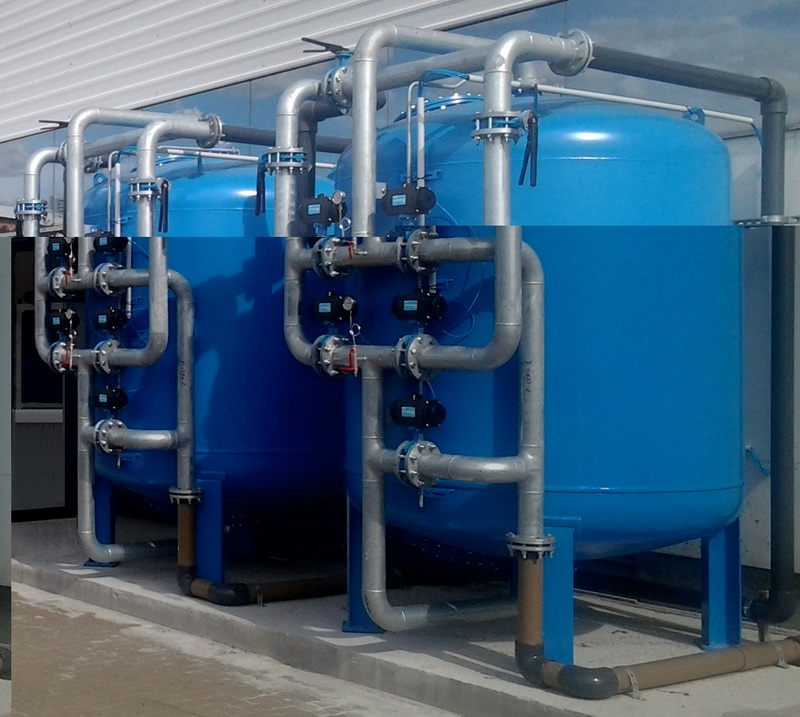 All the DTP system is filled of water and it operates completely under the pressure given by the initial pump. This is maintained right through to the processing machines. Several visual and electronic pressure meters control the pumps’ work and provide information to the main CPU. The dirty water is pumped into a small hole in the bottom part of the tank and then flows out from the top of the tank almost completely cleaned. 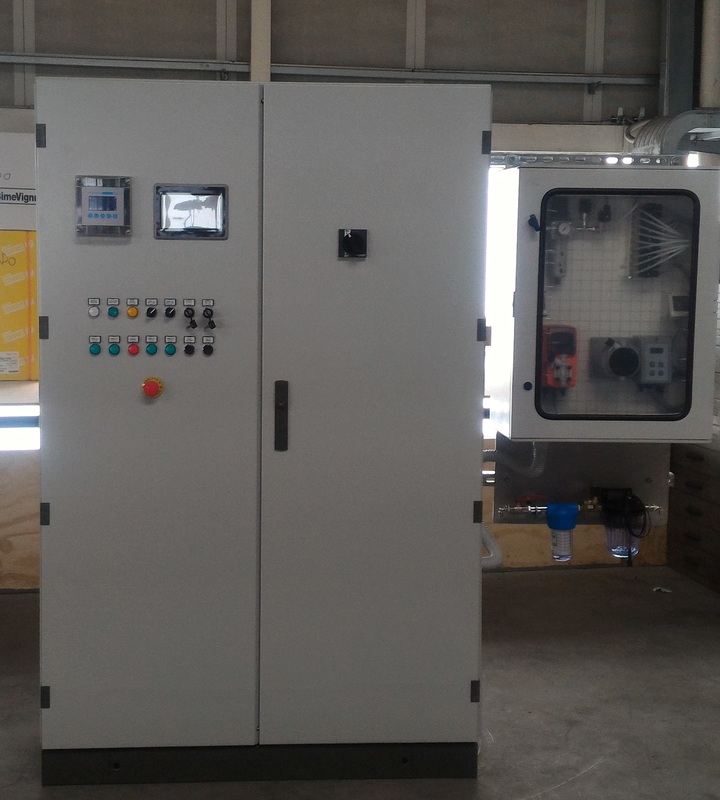 The sequence of the 2 pneumatic valves operation is at scheduled times controlled by the data coming from the flow controls. The mineral filter combination of circuits allows in automatic-mode the followings: WORK – SELFWASHING – RINSE – FILTER BYPASS (this last one is only in safety mode). The rinse (back-flushing) water is dumped to waste. Inside the filter, 2 iron plates with dozens of holes on each. 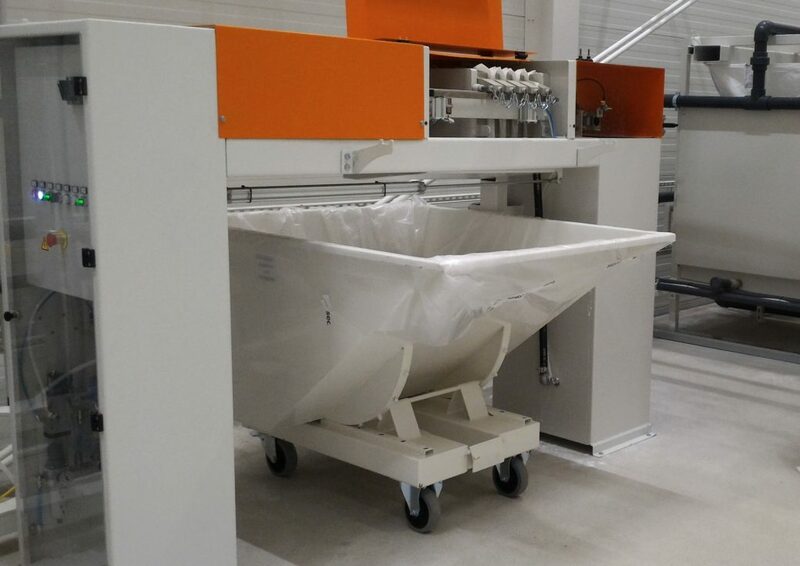 Each hole is fitted with an ejector, which holds the minerals inside the unit and lets the water pass through, both during the WORK and the SELFWASH and RINSE cycles. The dirty water discharged during the self-washing cycle returns into the initial collection tank. 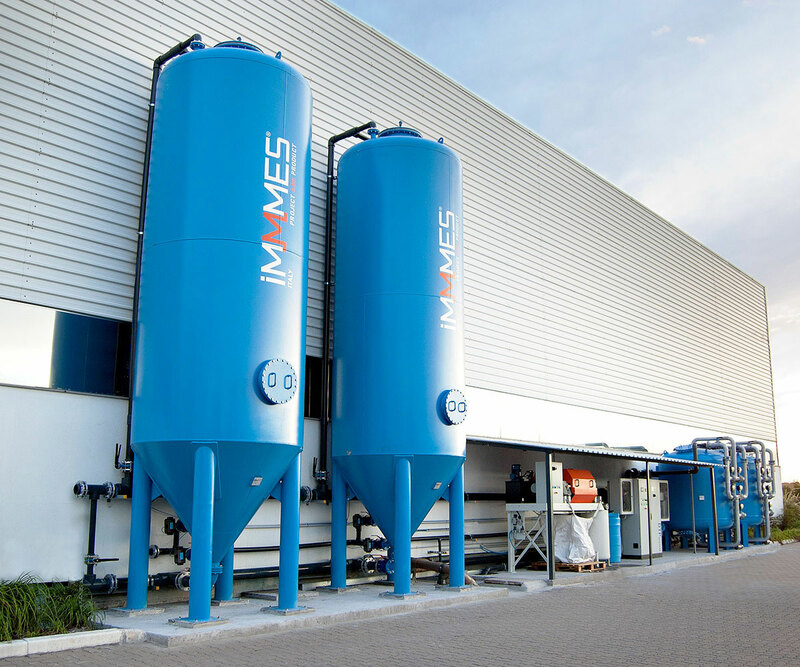 The Deconcentrator’s two sludge discharge lines with water which is heavy charged with glass mud, leads to a “Big-Bag” filtration station. Two disposable big bags filter the water, keeping inside the bag the solids (sludge) and filtering the residual water into a base tank/basin and from there back to the initial collection tank. The removal of the big bag, when filled with solid sludge, is made with a simple forklift and replaced with a new one. 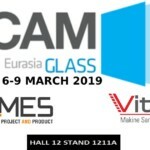 The system is available in different sizes from 12 to 250 m3/hour (see table joined) to satisfy all requirements, from the small laboratory to the giants of glass processing.